It has now been well established that the depth of bedrock is a key parameter in assessing the impact of local site conditions on seismic hazard analysis. Where conventional geotechnical testing like standard penetration test (SPT) or cone penetration test (CPT) requires a far greater cost and manpower to be used for such purposes, geophysical testing like ground-penetrating radar (GPR) and multichannel analysis of surface waves (MASW) may provide the researchers with more viable options to achieve conclusive evidence on bedrock depth. Application of geophysical techniques has become more and more extensive and advanced in many geo-morphological studies since the early 2000s. Geophysical techniques require less time and effort, and the easy processing of the obtained data is the primary reason for their popularity. However, due to variability in subsoil mechanical properties, wave attenuation and dispersion and diverse geological boundary conditions, the results obtained through geophysical techniques are often ambiguous and non-unique. The interpretation of the obtained data also requires skill and experience, as the range may vary widely and more often than not consensus is difficult to achieve. In this paper, an endeavor has been made to coalesce the results of two widely used geophysical techniques, namely GPR and MASW to derive more conclusive evidence for the detection of bedrock depth in a part of Garhwal Himalayas. The study area comprises of two different cities of Uttarakhand, India. Both the sites possess different geo-morphological attributes and thus prove to be a perfect platform to conduct the experimentations. Both GPR and MASW testing have been performed and results are shown in graphical format. A comparison of the GPR survey with a conventional geotechnical testing (SPT) is also presented here. This study shows that GPR and MASW can provide complementary results in estimating bedrock depth. The influence of local site conditions on amplification of strong ground motion has been widely recognized. Several examples from the past (e.g., 1985 Mexico earthquake, 1989 Loma Pieta earthquake, 2001 Bhuj earthquake) have demonstrated that local site conditions play a substantial role in the performance of the structures during a major earthquake. It is now a well-accepted fact that the depth of bedrock significantly alters the dynamics of the system as a whole (Nath and Jakka 2012). Hence, it is preferred to estimate the depth of bedrock as accurately as possible considering its implication on seismic hazard analysis (Bard 1995; Boore 2004; Nath et al. 2015). However, if the conventional methods of geotechnical exploration down to the bedrock level are to be employed for such studies, one has to face some very stiff challenges in terms of both cost involved and manpower required. With the advent of various geophysical methods as a tool to explore subsurface geology, seismologists and engineers have begun to venture this challenging terrain. As pointed out by Van Dam (2012), geophysical techniques require less time and effort, and the easy processing of the obtained data are the primary factors behind their popularity. The proliferation in technical innovation as computers, software technology and light weight equipments also influence the increasing interest in geophysical explorations. Many researchers focus on the use of the geophysical application in fossil fuel exploration, existence of minerals and detection of underground water level. Of late, the use of geophysical methods become sustainable and functional in the field of permafrost mapping, block field, sediment thickness, depth and internal structures of landslides (Hauck 2001; Schrott 2002; Israil and Pachauri 2003; SchSrott et al. 2003; Bichler et al. 2004; Sass 2007). However, due to variability in subsoil mechanical properties, wave attenuation and dispersion and different geological boundary conditions, the results obtained through geophysical techniques are often ambiguous and non-unique. The interpretation of the obtained data requires skill and experience, as the range may vary widely and more often than not consensus is difficult to achieve. Schrott and Saas (2007) have recommended the use of two or more geophysical methods to reach a strong conclusion, rather than a single method. The study has focused on the development of a set of most favorable conditions for combining different geophysical techniques. Although studies on combined application of two or more geophysical techniques are becoming popular nowadays (Pilecki et al. 2017), there has not been much combined studies carried on estimation of bedrock depth, especially for the Garhwal Himalayan region. The whole Himalayan arc has always been seismically very active and produced several catastrophic earthquakes (1897 Assam, 1905 Kangra, 1934 Bihar–Nepal, 1950 Assam, 1991 Uttarkashi, 1999 Chamoli) and many small- to medium-scale earthquakes in the past (Nath and Thingbaijam 2012). Therefore, it is of paramount importance to comprehend the local site conditions of the area: both qualitatively and quantitatively. 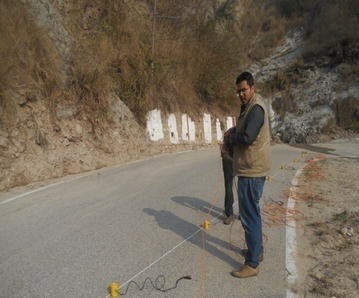 In this paper, an attempt has been made to combine the results of two widely used geophysical techniques, namely GPR and MASW, for estimation of the bedrock depth in a part of Garhwal Himalayas. The study shows that both geophysical techniques produce results which are more or less complementary in nature and thus can be used to have a better engineering insight. For the present study, two sites in the state of Uttarakhand, India, were selected. The first site of the study area is the Santura Devi temple of Mussoorie, a famous hill station of Dehradun District. The study area and its environs exhibit geological similarities with the northern limb of the Mussoorie Syncline. Sedimentary rocks, typically Krol and Blaini formation of the Lesser Himalaya shape this landscape, with dolomitic limestone and shales being the most common types (Pal et al. 2012). Near vertical discontinuities mark the highly jointed and fractured rock mass. The key criterion for selection of this site is its proximity to the main boundary thrust (MBT) due to which the level of seismic hazard is very high here. The second site in the study area is the Mansadevi landslide of Haridwar District. By selecting a landslide, the utility of GPR and MASW in landslide studies could also be evaluated and this motivates the site selection criterion here. The lithology of the area comprises conglomerate, sandstone and mudstone sequence of Pliocene to early Pleistocene age. They belong to middle to upper Siwalik group with sedimentary formation (Mittal et al. 2008). The landslide has been affected by severe tectonic movement along the Main Frontal Thrust, Ganga Tear Fault, and several minor faults located in its vicinity. The presence of a shear zone in the area is felt by the nature of material yielding, most commonly observed as breaking off, toppling and/or sliding of mudstone or sandstone. The general and geo-morphological attributes of the study area are presented by Fig. 1a, b below. The tectonic setup of the study area has been studied quite extensively and is easily available (Joshi and Mohan 2010; Patil et al. 2014). Both the sites selected for the study possess different geomorphologic attributes and bedrock is expected to be at different depths for each site. Thus, it provides a perfect platform to conduct such study. GPR is a very useful noninvasive, nondestructive geophysical tool primarily used for subsurface imaging. GPR gives result with high resolution at shallow depth up to 0–10 m. It may be used to explore even greater depth up to 50 m, but the accuracy and resolution will be compromised. It mainly works on the principle of dielectric constant. Below the earth surface there exists various soil layers with different dielectric constants. Soil layers with higher dielectric constant will have lower electromagnetic wave velocity and vice versa. GPR contains antennas of varying frequencies, ranging between 10 MHz and 4 GHz. The penetration depth of the electromagnetic wave depends on the frequency of the antenna. GPR can either be used in reflection or transmission modes. The reflection profiling survey method is the most common and is normally conducted using two antennae (called the bi-static mode), with a separate transmitter and receiver. These antennae are placed directly on, or relatively close to, the ground surface to be measured. The antennae may also be mounted on a wheeled trolley or sled to protect the equipment and to speed up the survey. Although Bristow and Jol (2003) have observed that 100 MHz antenna provides the best trade-off between depth of penetration and resolution of the image, after a sensitivity analysis at the site, lower-frequency antennas of 80 and 35 MHz have been used here considering that the main objective of the study is to estimate the bedrock depth. Sass (2007) has carried out an extensive study to measure the sediment thickness of alpine talus slopes using three different geophysical techniques (GPR, 2-D resistivity and seismic refraction) and observed that the combined application of two or three techniques had improved data interpretation. The range and resolution of GPR results mainly depend on sediment mineralogy and GPR antenna frequency (Motoyuki 2001). The main limitation of GPR lies in its incapability to provide any information on either index properties or mechanical properties of the subsurface geology. As the penetration depth of electromagnetic waves depends on electrical resistivity and conductivity of soil, the moisture content of the soil greatly influences the results of GPR. Figure 2 shows a typical set of GPR testing conducted at a particular site in the study. The system has five main components: (i) control unit, (ii) transmitter, (iii) receiver, (iv) antennae and (v) interface, data storage and display module. Data were transferred from the antennae to the control unit through fiber-optic cables. Automatic gain control (AGC) was applied as it is the best way of acquiring data (Neal 2004). Data were collected by point to point mode of survey, and a sensitivity analysis was performed beforehand to decide the optimum antenna frequency to be used for that site, step size and the antenna separation distance. Collected data were processed as described by Fisher et al. (2000), using GPR Manual Version 7.0 supplied by Geophysical Survey System Instruments (GSSI), with GSSI computer-based RADAN software by applying infinite impulse response (IIR), finite impulse response (FIR) filters, 2-D spatial fast Fourier transform filters, gain control, surface normalization, de-convolution, band pass filtering and hyperbola migration. MASW method is a surface wave technique for estimation of dynamic soil properties of the underlying soil strata using the dispersive characteristics of surface waves in layered media (Park et al. 1999). For this technique, a linear array of geophones is used to record vertical components of the vibration generated at one end of the array. The phase difference between records of different sensors is calculated for all frequencies which in turn provide the phase velocity of that frequency, as the distance between the sensors is known. Using this method shear wave velocity profiles can be estimated down to several tens of meters. The choice of equipment and testing configuration is closely linked to the scope of the test and the technique to be used in the interpretation. Sitharam (2006) carried out an MASW survey and concluded that MASW can be effectively used for the soil layer profiling and identification of rock depth and measurement of dynamic properties. Mahajan et al. 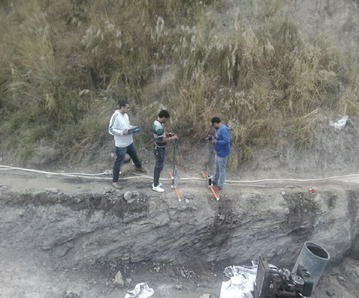 (2011) have conducted studies on characterization of sediments in the Himalayan foothills using both active and passive MASW techniques. More recently, Pandey et al. (2016) carried out extensive MASW studies for quantifying the influence of local site conditions on strong ground motions. MASW is a well-accepted and widely used method for seismic microzonation studies. For conducting MASW testing, equipment known as McSeis-SXW, manufactured by OYO Corporation Japan, was used. The geophones used were of 2 Hz frequency and an 80-kg drop weight hammer was used as the source. After finalizing the location, an array of 24 geophones of 2 Hz frequency was laid out at the spacing of 2 m. The geophones were connected to the data acquisition device. The “2-D surface wave method” was opted in the data acquisition device for conducting the required survey. The drop weight hammer was placed at 2 m intervals for each shot. The starting location was 1 m prior to the first sensor in the line of sensors. The last location was 1 m away from the last sensor in the line of sensors. Hence, a total of 25 shots were recorded for each station. The data recorded in 25 shots were then analyzed using the software SeisImager/SW. The SeisImager/SW software has three more tools, i.e., PickWin95, WaveEq and GeoPlot, which are used for further analysis. A detailed description of the procedure is not provided here due to paucity of both scope and space. Figure 3 shows a typical set of MASW testing conducted at a particular site in the study. It is widely acknowledged that the uncertainties associated with any geophysical exploration is quite high and hence it is imperative that any data obtained through geophysical exploration should be weighed against those obtained through a geotechnical investigation. Therefore, a study was carried out beforehand to validate the data obtained from GPR against conventional standard penetration test (SPT). For this purpose, Roorkee, Uttarakhand, India, was selected. SPT was conducted at numerous places in and around this site and those data are easily available. A very thick layer of alluvial sedimentary deposit underlines the bedrock here. The lithology of the area comprises cyclic sequence of gray micaceous sand, silt and clay/brownish gray clay, sand and gravel with boulders of Quaternary age. The soil here is mostly poorly graded. Table 1 shows the results of one such SPT for a particular site at which a GPR survey was performed. The results show that three distinct soil layers are present up to 9.0 m of depth at this site. Following laboratory testing, the types of soil were determined as poorly graded sand (SP) and lean clay or clay of low plasticity (CL). The results of GPR survey are shown in Fig. 4. GPR provides information up to a depth of 17.5 m belowground level with three distinct soil layers of different thickness. Demarking the ground level at 0 m height, the first layer extends up to 2 m. Similarly, the second and the third layers are marked at 7 m (a total thickness of 5 m) and 14 m (a total thickness of 7 m), respectively. These results show excellent concurrence to the SPT data obtained and hence can be used to validate the use of GPR for subsurface exploration. However, GPR does not reveal any mechanical or index properties of the layers, which is a big limitation of the technique. Therefore, combining the results of the both geotechnical and geophysical investigations, different soil types are determined as shown in Fig. 4. Moreover, the GPR data shows a gentle slope from 7 to 10 m depth, which was not revealed during SPT. However, it is to be understood that GPR does not work as well in conductive/clay-rich environments, due to signal attenuation. With this in mind, it is possible that the sloping layer of Fig. 4 could be the tail of a diffraction hyperbolae, and therefore an artifact from above ground rather than a true subsurface feature. Although with GPR, up to 17 m depth has been explored, it is very difficult to process the data obtained below 14 m depth. This may be attributed to scattering and dispersion of EM waves below that depth. It is understood that for deep alluvial soil deposits, GPR is not solely sufficient for subsurface exploration. It gives an idea about the boundary conditions where dielectric constants change with different material properties. Using sound engineering judgment, this information can be effectively maneuvered in deciding the thickness of subsurface layering. To estimate the bedrock depth, both GPR and MASW experiments were carried out at the first site of the study area. For the GPR survey, 80 and 35 MHz frequency antenna were used. Data were collected in bi-static staking (point) mode of survey. The results of the GPR survey have been shown in Fig. 5a, b. While 80 MHz frequency antenna provides higher resolution, it delivers information only up to a depth of 17.5 m. So, 35 MHz frequency antenna was used to explore greater depth. Approximately, 35 m of subsurface depth was imaged, although resolution was compromised. As the aim of the study is to locate the bedrock, the resolution provided by the 35 MHz antenna is considered to be sufficient here. Both profiles were taken along the same line, but in the reverse direction. As it is a well known fact that GPR results do not provide any information on mechanical and/or index properties of the subsurface geology, the different layers shown in the results are assumed based on visual inspection of the structural discontinuities in the recorded images. The parallel reflectors at the top of Fig. 5a from the surface to 1 m depth form the first layer. It is followed by a layer of hummocky reflectors with 2 m depth which constitutes the second layer. Thus from the surface down to 3 m depth, two subsurface layers have been assumed. From 3 to 17.5 m parallel reflectors could be observed which form the next layer. Within this layer, one can observe an inclined layer clearly. While arguments could be made that this layer inclination is the tail of a diffraction hyperbolae, and therefore an artifact from aboveground rather than a true subsurface feature; the topography of the survey site would suggest otherwise (the survey was carried out on a slope itself). Hence, we would like to believe that it is indeed a subsurface feature which will be further discussed in the MASW section. Similarly for Fig. 5b, three geological layers have been assumed based on the characteristics of the reflectors. Bedrock is estimated to be located around ~ 24 m from the ground surface. Two layers of soil strata exist at the depth range 0–3 m and 3–24 m. In between 3 and 19 m, another inclined layer has been detected. Below 24 m depth, there is a zone of signal attenuation, which is later assessed to be the bedrock with the support of MASW data. The shear wave velocity profile of the same was then obtained using an MASW setup (Fig. 6). Table 2 summarizes the results of the MASW experiments at the site. Shear wave velocity (Vs) actually represents the velocity with which earthquake shear wave will propagate through a material of interest, often soil and rock. The significance of shear wave velocity lies in the fact that it is directly proportional to shear modulus (G) of soil/rock, a dynamic property. Thus, estimating the shear wave velocity profile at a particular site becomes the first step in assessing the local site conditions prevailing at that site, as it gives a very clear picture of the stiffness of different layers. In most of the seismic hazard analysis, engineering bedrock is defined as the layer where Vs ≥ 760 m/s (Anbazhagan and Sitharam 2009) or corresponds to Site Class B and above in NEHRP site classification. The shear wave velocity in an intact rock (geological bedrock) is expected to exceed 1000 m/s (Miller et al. 1999). If we try to comprehend the results of both GPR and MASW simultaneously, some very interesting observations will come up. The subsurface imaging provided by the GPR survey clearly indicates that there exists an inclined soil layer between 0 and 24 m depths from the surface. The MASW results show a very weak layer (Vs ~ 300 m/s) of 5 m thickness between 17 and 22 m. The sudden drop in shear wave velocity can be attributed to the layer inclination here. And the immediate next to the inclined layer, a very high rise in shear wave velocity has been recorded. This value of shear wave velocity corresponds to hard rock, which is subsequently estimated to be the bedrock by GPR survey as well. The findings of the study for this particular site demonstrate not only how complementary and conclusive both the geophysical methods are, but also provide significant information on local site conditions prevailing in the area. These data can be very useful in assessing the overall seismic risk of the area. “- The bedrock surface does not necessarily cause a strong radar reflection if the K′ (the real part of the dielectric constant) values of rock and debris are very similar. The lithology of the Mansadevi landslide comprises conglomerate, sandstone and mudstone sequences. Due to its proximity to both MBT and MFT, the transitory stresses are expected to be very high here which leads to its fragile geomorphology. Thus, there is a higher probability that both the bedrock and debris will have more or less similar K′ values and therefore any conclusive inference could not be drawn for this site. To estimate the bedrock depth conclusively, MASW testing was performed at the same site. The 24-channel MASW setup was used. But again with this setup, only up to 46 m from the surface could be explored. The shear wave velocity profile of the site is shown in Fig. 8. Table 3 summarizes the results of the MASW experiment at Mansadevi landslide, Haridwar. The results show that no bedrock (either engineering or geological) could be detected here at this site, as Vs does not exceed 760 m/s. Although for this particular site no conclusive evidence on bedrock depth could be drawn, both the methods provide fascinating vital information on the subsurface condition. GPR survey reveals that the top 2 m of soil is in a very loose state and thus can be considered as the debris of the landslide. The shear wave velocity profile obtained from MASW testing shows that the range of Vs lies between 400 and 530 m/s, which is somewhat less than the expected values in the region. The fragile geomorphology of the landslide which is underlined by highly jointed and fractured rock mass can be considered as the main factor for this. We also acknowledge the fact that the level of uncertainties remains high for the MASW results in this particular site, owing to its high gradients. Hence, a reduction of around 20% in shear wave velocity is recommended for the top layer of the site. Thus, a combination of test results obtained from GPR survey and MASW may be very useful for any landslide study (primarily, for calculation of debris volume and understanding the internal structures). The local geology and the geo-morphological evidences when vetted against the results obtained led us to believe that for this site distinctive bedrocks do not exist at shallow depths. As observed by Nath and Jakka (2012), bedrock depth can significantly alter the frequency content and amplification of the input motion. In general, shallower bedrock depth means very high amplification of input motions at higher frequencies (> 10 Hz) and higher depth of bedrock will produce high amplification in lower frequencies (1–3 Hz). However, a number of factors, viz., the impedance contrast, soil layering and water table depth also play a major role in this highly intricate phenomenon. Combining two geophysical methods to estimate the bedrock depth has greatly contributed to the credibility of the results, as can been seen for the first site. Even when bedrock depth could not be estimated precisely for the second site, vital information on the local site conditions could be extracted from this study. The main aim of the present study is to estimate the depth of bedrock in a part of Garhwal Himalaya. Two different sites of Uttarakhand, India, with different geological attributes were selected. GPR and MASW experiments have been performed on both the sites and results obtained are combined to arrive at concurrent conclusions. For one site, a conclusive inference on bedrock depth could be drawn, whereas for the other site vital information regarding subsurface geology could be extracted. The study clearly demonstrates that it is feasible to combine the results obtained through more than one geophysical technique for subsurface exploration. Although both GPR and MASW provide two different genres of information, they can be combined effectively for comprehending the local site conditions. Each geophysical technique has its own merits and demerits and proper attention should be paid before finalizing the selection of a particular technique. This problem may be averted by selecting two or more methods together. RRN and GK carried out the field experiments. RRN and MLS decided on the methodology. RRN and SCG carried out the observation. All authors discussed the results obtained and drafted the manuscript in corporation. All authors read and approved the final manuscript. The authors would like to acknowledge the help of Mr. Sanjeev Astval and Mr. Anuj Gaur, Lab Assistants, Earthquake Engineering Department, IIT Roorkee, during the field visits. The data set generated for the study area is available from the corresponding author on reasonable request.